And, yes! – the day we celebrate Mexican heritage and pride certainly would have been the perfect occasion to trot out this recipe and serve alongside your frosty Coronas and guacamole. But it’s not too late. The Preakness – the second jewel in the Triple Crown – is this weekend. Memorial Day weekend is next. And unless you’re already dead, you’ve probably been invited to somebody’s graduation. In other words, there’s a party in there, somewhere – and every party is better when these Barbecue Chicken Empanadas show up. Empanadas are stuffed pastries, typically savory, found throughout Latin America. 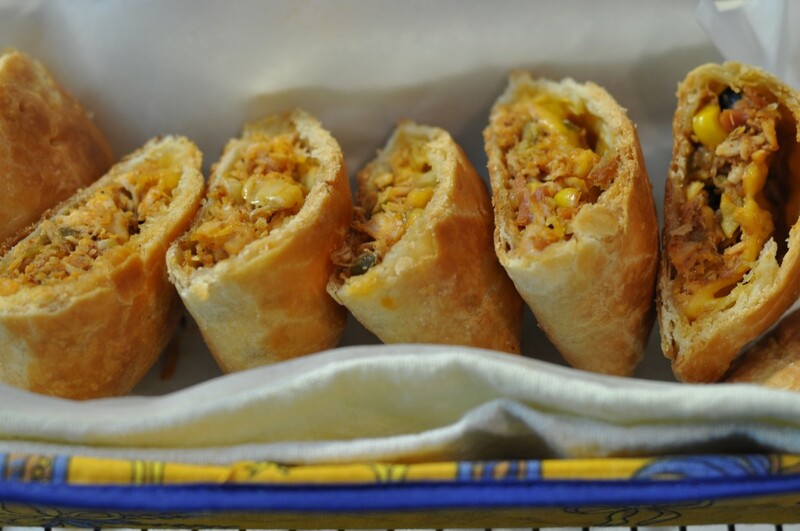 They can be large or small, and stuffed with everything from meats and fish to vegetables and legumes. In this country, you normally find empanadas stuffed with ground beef , but this version uses chicken that’s been heated in a sort of enhanced barbecue sauce. A fair amount of seasoning is typical because you don’t want the flavor of the filling to get lost among the pastry. Nor do you want to shortchange the amount of filling you can add, which is why I like to partially grind the chicken mixture in the food processor before I use it. Don’t go crazy with the processor, please. You just want to chop it up well, not turn it into chicken soup. Try not to be greedy and overfill the empanadas; I still do that on occasion. It’s natural to want to make them good and plump, but it causes problems when you try to close and seal them. I find that is sometimes easier to fold the dough over loosely, pick up the empanada and line up the edges, then press them together. Try it and see if that works for you. If you have parchment paper, line your baking sheet with it. (I just ordered a fresh box of 1,000 sheets from Amazon.) Otherwise, just put them right on your baking sheet and brush lightly with the glaze. If it looks like I just poked the top of the empanadas with a fork, that’s because I did. The holes let off steam so they don’t puff up like a balloon, explode, and find you cleaning your often when guests arrive. 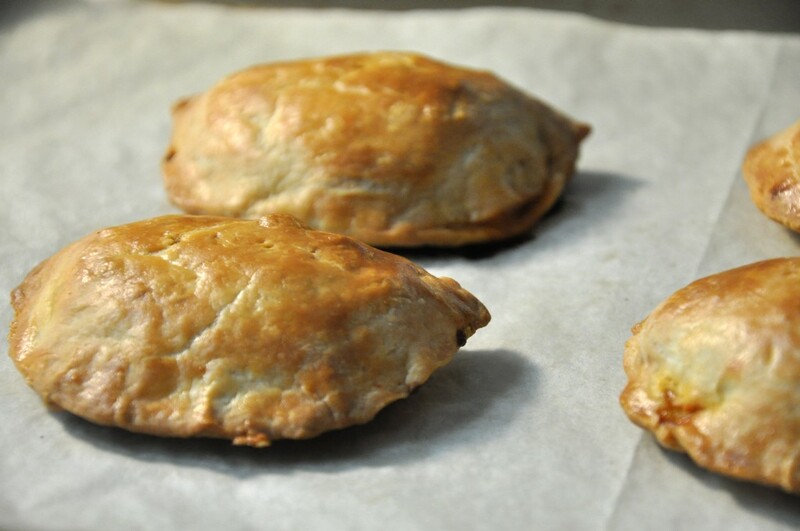 By the way, empanada dough is similar to pie dough, but it typically has less fat, more liquid, and an egg – all things that make the pastry a little more rugged and suitable for hand-held fare. Consider it a courtesy to your guests, who might be embarrassed if their empanadas self-destructed while they were giving you a hot stock tip or bragging about their kids. As for serving, if they’re really small you can serve them whole. The ones we make here are just big enough to cut in half and serve up something like this, in a lined basket. But no matter how you slice ’em, these are sure to please. Enjoy! Prepare the empanada dough as instructed. Divide it into 16 equal pieces and roll each piece into a ball. Flatten each ball into a fat disk and place on small baking sheet lined with plastic wrap. Cover with plastic and refrigerate for at least 1 hour. Prepare the filling: Heat the oil in a large skillet. Stir in the onion and bell pepper; saute for 6 to 7 minutes over moderate heat. Stir in the garlic, chili powder, smoked paprika, and cumin and saute 30 seconds. 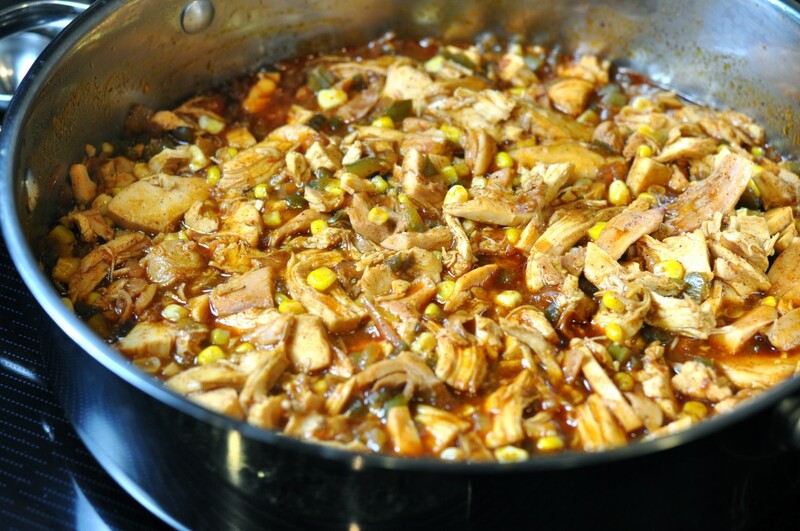 Put the cooled chicken in a food processor and chop it up with 4 or 5 quick pulses. This is an important step because you can fit more meat into the empanadas if the meat is ground. Don’t over-chop; it should maintain some texture. 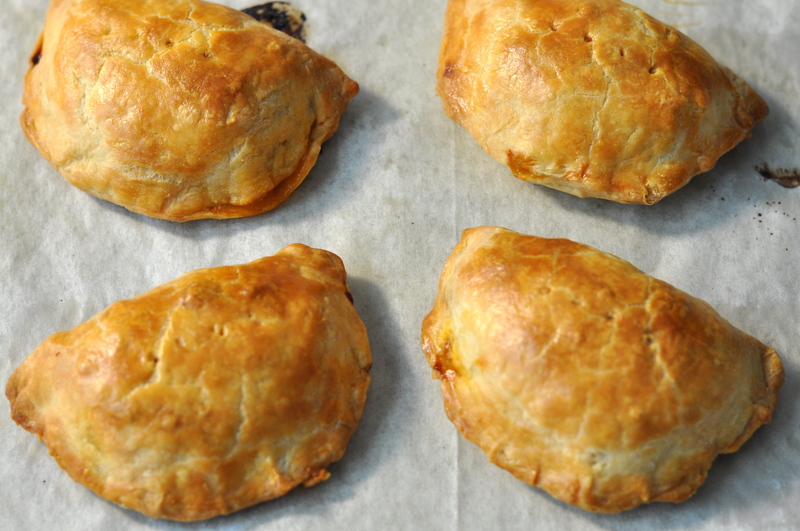 When you’re ready to assemble and bake the empanadas, preheat the oven to 375°. Working with one piece of dough at a time, roll it into a 6-inch long oval about 4 1/2-inches wide on a floured surface. 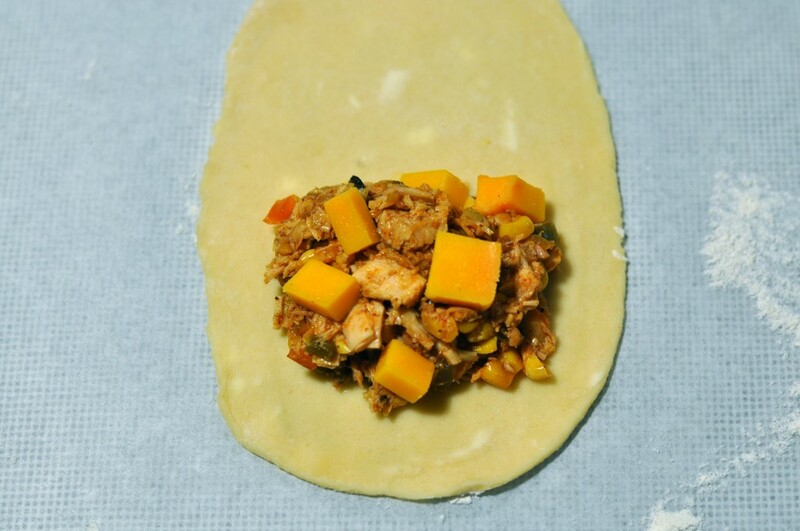 Place about 3 tablespoons of the filling on one half of the oval. Top with a bit of the cheese. Moisten the edge of the circle with a wet fingertip, then fold the uncovered half over the filling until the edges line up. 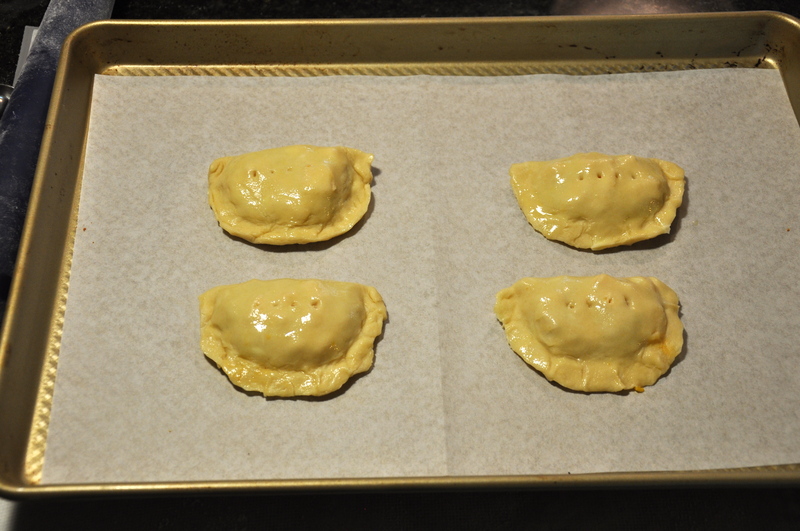 Press the edges together and place the empanada on a large, lightly-greased or parchment-lined baking sheet. Repeat for the remaining empanadas. Poke the top of each one with a fork, to vent, then brush lightly with the glaze. Bake on the center oven rack for 25 minutes, until golden brown. Transfer the empanadas to a rack and cool for at least 10 minutes before serving. Makes 16 appetizer servings. Combine the flour and salt in the bowl of a food processor. Pulse the machine several times, to mix. Remove the lid and scatter the butter and shortening over the dry ingredients. Pulse the machine briefly, 6 or 7 times, breaking the fat into pea-size bits. Whisk the water, egg, and vinegar in a small bowl. Remove the lid and add the liquid to the processor. Replace lid and pulse the machine, repeatedly, just until the dough starts to clump together. Stop the machine and turn the dough out onto your work surface. Proceed as directed. (To make the dough by hand, mix the flour and salt in a large bowl. Cut in the butter and shortening until broken into fine bits. Whisk the water, egg, and vinegar. Stir into the flour all at once, until the dough pulls together.) Makes enough dough for 12 to16 empanadas.